The PC browser and smart phone game "Touken Ranbu-ONLINE-" created by Nitroplus went on to inspire a series of stage-play Touken Ranbu productions - also known as "Tou-Sute." 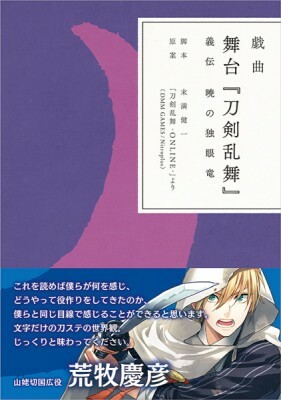 A book for the second stage production "Canon: Dawn of the One-Eyed Dragon," was released in January 2018! In addition to the stage production's original story, it includes an afterword from script writer and director Kenichi Suemitsu. Experience a whole new foundation of the Touken Ranbu world woven in words! ・All text in this book is written in Japanese. ・"Stage Umbrella Pin-Badge" bonus is not included. ・Images are for illustrative purposes only. Actual product may slightly vary.